I focused on the colours and the wreath. I used the new Stampin' Up Wondrous Wreath that everyone seems to have (and why not - it's graphic and classic and so versatile!) I used a red copic tip to create my little berries. I used silver embossing for my Kaisercraft sentiment to represent the skate blades. Now it's your turn. In addition to our regular DT members, we've got a Guest Designer for this challenge and you're going to love her interpretation! This challenge will run until midnight on Wednesday October 8. Oh love the crispness of your design Ardyth. The white panel on the brown background DP nicely attracts the eye. Your wreath and berries pop. Your design is flawless as always. 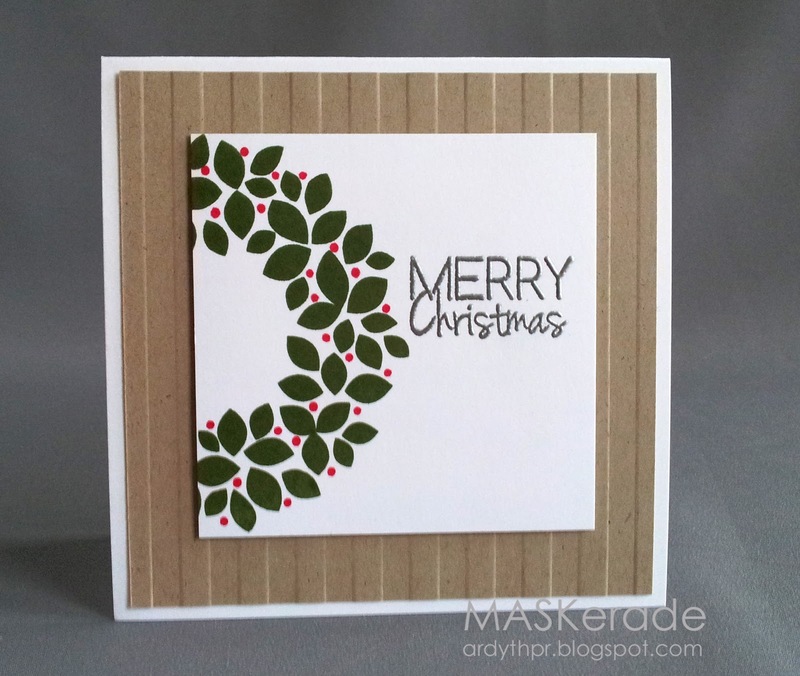 Gorgeous; your wreath panel pops against the kraft background wonderfully. I have but 3 Christmas cards made..eeek! Thought that I was at the wrong blog for a minute there...the patterned paper threw me off! Great call cuz it is the perfect interpretation of the photo! Love the 'skate blade' embossed sentiment. I'm e-mailing my SU lady asap to order that gorgeous wreath! Love the design of the card, Ardyth, and the pinstripe paper. Fantastic design Ardyth! There is the wreath, maybe Ii should get it to CASE you. Beautiful design and card Ardyth! I love the wreath stamped on just half of the panel! I have no idea what you stamped that wreath in but talk about good coverage! I love your off center design with the texture background. Beautiful!! This is so beautiful and I love the deep green ink you used, so pretty with the red berries. I love how simple yet graphic this card is! Great design.